Welcome to Northern Filter Media! We will be celebrating our 100th year anniversary in 2014. During this century in business, Northern Filter Media has expanded its product offering to include the most complete source of filtration products for the potable, wastewater, well pack and swimming pool industries in the United States. We have invested and continue to invest significantly in Research and Development of new products. Northern Filter Media is proud to announce our new patented, environmentally friendly and EPA Registered antimicrobial filter media products. 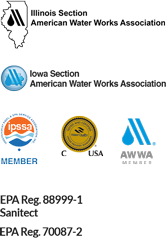 Our new products, UltraPerl, Zeobest Ultra and Northern Ultra will debut in the pool and spa markets first. We are excited to expand into other water treatment applications in the very near future. Please take a moment to look through our website! We include product information, specifications, typical gradations, MSDS and much more for each of our products. Most all of the information can be printed in PDF format directly from any web page. An easy to use Quote System is available to submit and receive a quote from us for your project or requirements regardless of size. Filter Media is our only business! 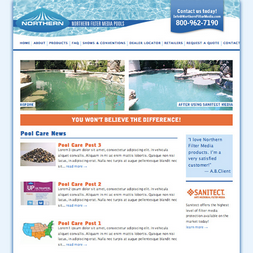 Don’t forget to visit our swimming pool website, NFMpools.com, which includes an informative blog and an FAQ section.